Not in Australia this Sunday, but on the way there. 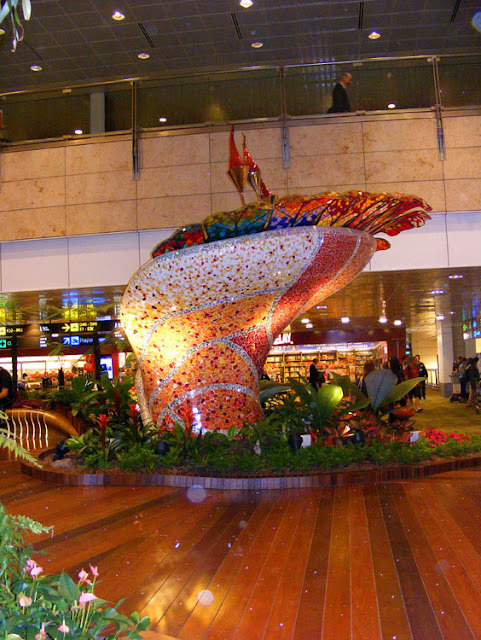 These magnificent glass sculptures are in the transit area of Terminal 2 at Changi Airport, Singapore. 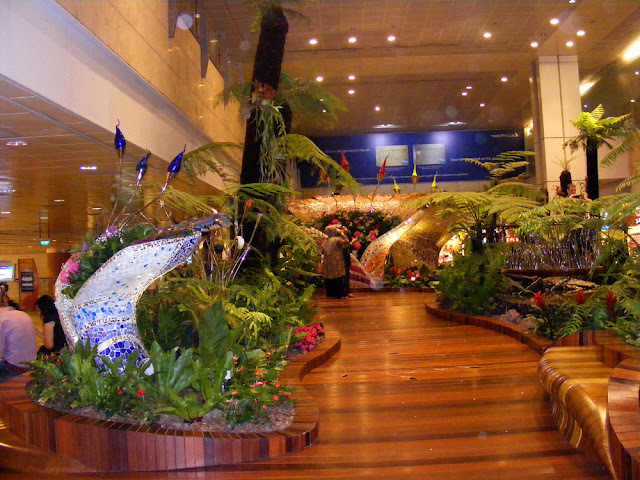 The giant glass cornucopias are filled with fresh flowers and surrounded by ferns. 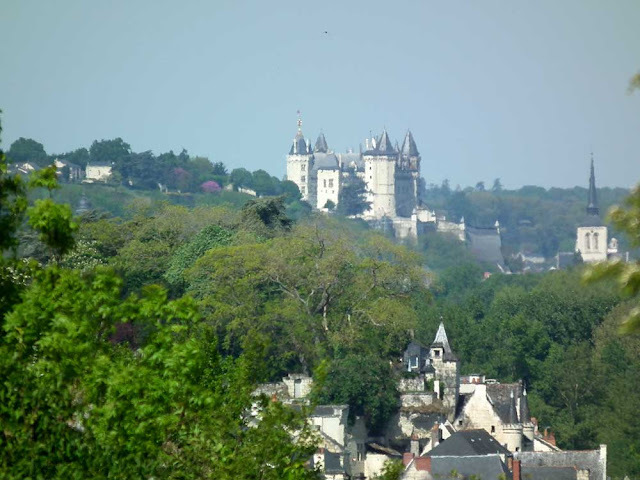 The chateau of Saumur, taken from the porch of the church of Saint Pierre, Parnay. The chateau is about 8km away. 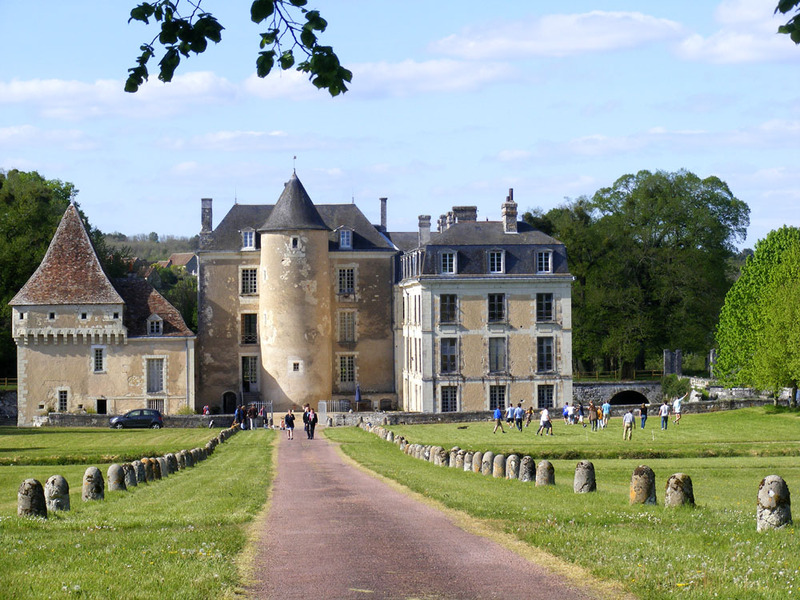 ...a chateau to the right. forest beyond. The Loire Valley in a single shot. 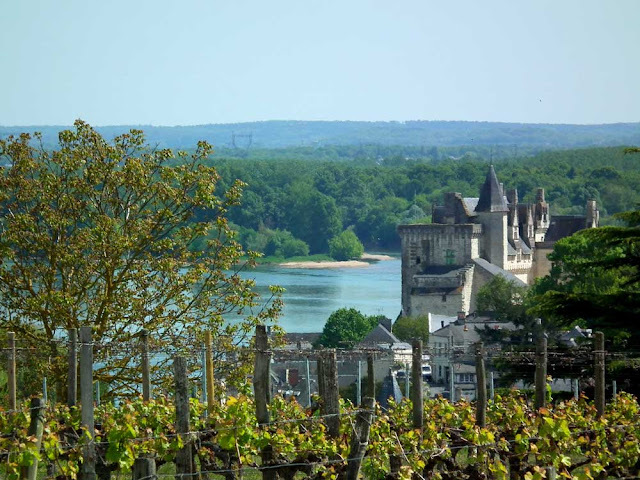 The two chateaux in these pictures are about 15 km apart, overlooking the Loire River from its southern bank in the département of Maine et Loire to the west of us. 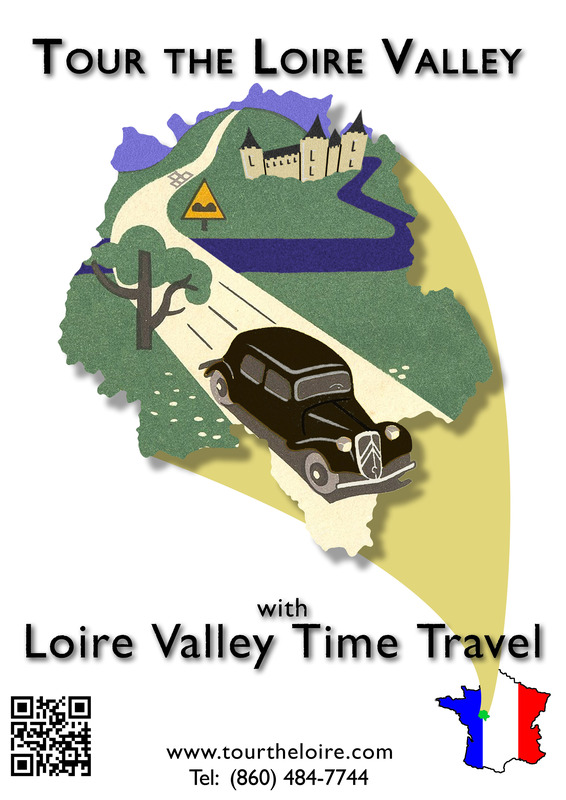 A couple of years ago we asked readers to print off and put up posters to promote our custom day trip and tour business Loire Valley Time Travel. 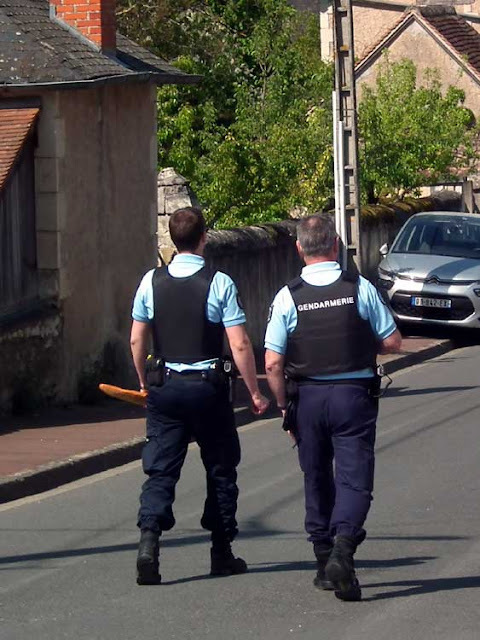 We thought you might be kind enough to help out again, by placing posters on notice boards at workplaces, where you have French lessons or anywhere you think someone planning a trip to France might see it. 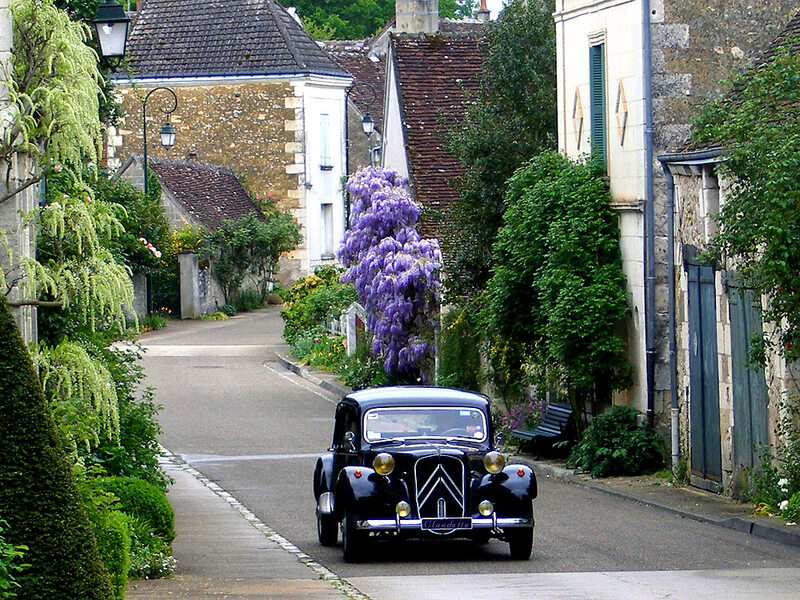 We would be delighted to treat you to the sights of Preuilly in Célestine if you are in the area and you let us know what clever spot you've stuck a poster. Once the poster has opened in a new window, download it to your computer. You can then print the image using your computer's print program. A typical spring scene in the Pays Saumurois, the countryside around the town of Saumur. 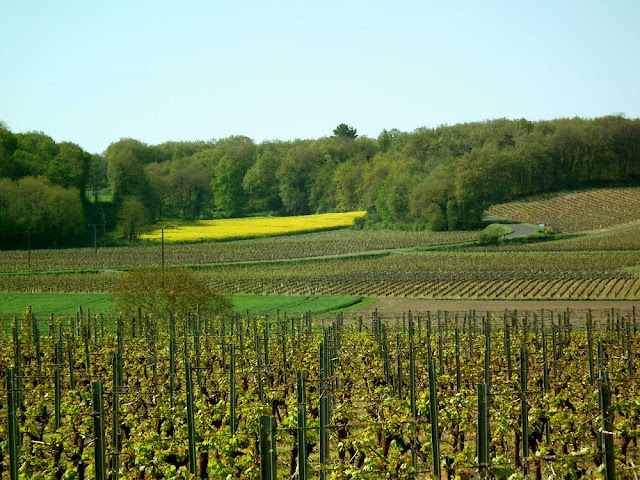 Lots of grapes, some wheat, some ploughed earth, some canola, a narrow winding bitumen road and on the highest ground, mixed deciduous broadleaf forest. The grape parcels have been hit variously by the recent hard frosts. Some are hardly touched, others are completely burnt to a crisp, some are only partially frosted. 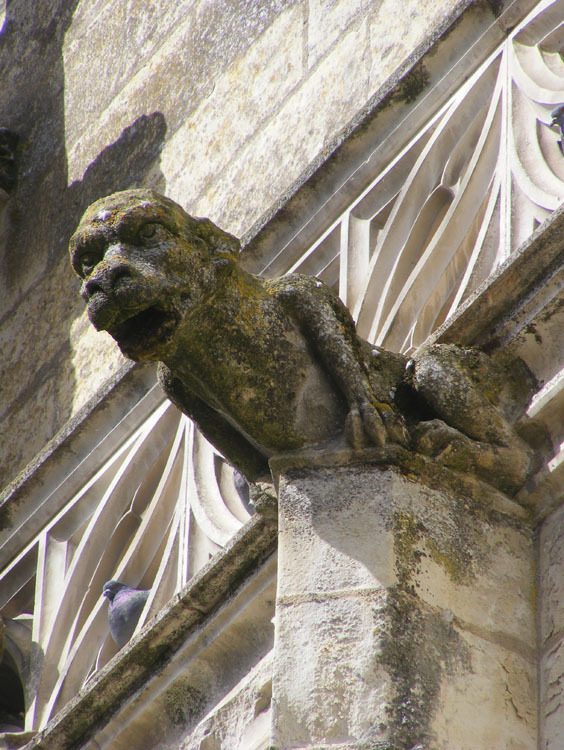 My estimate is about 50% losses in the area between Dampierre sur Loire and Montsoreau. These grapes will be mostly Cabernet Franc I think. 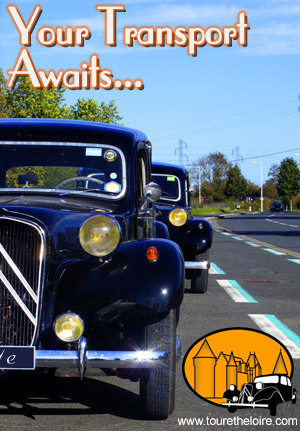 The road is wide enough for two cars to slip by one another going in opposite directions, but not wide enough to pass a slow vehicle going in the same direction safely and there is no central white line. The practically inclined amongst you will have immediately spotted the interesting design quirk. This photo was taken at Saturday's St George's Day fete. Today is Anzac Day, the day when Australians and New Zealanders remember the dead of two World Wars, Korea, Vietnam (in Australia) and the various other wars that the countries have been involved in. There will be ceremonies at War Memorials in every city, town and village in both countries, with some being broadcast on television. PITTSWORTH, March 10. 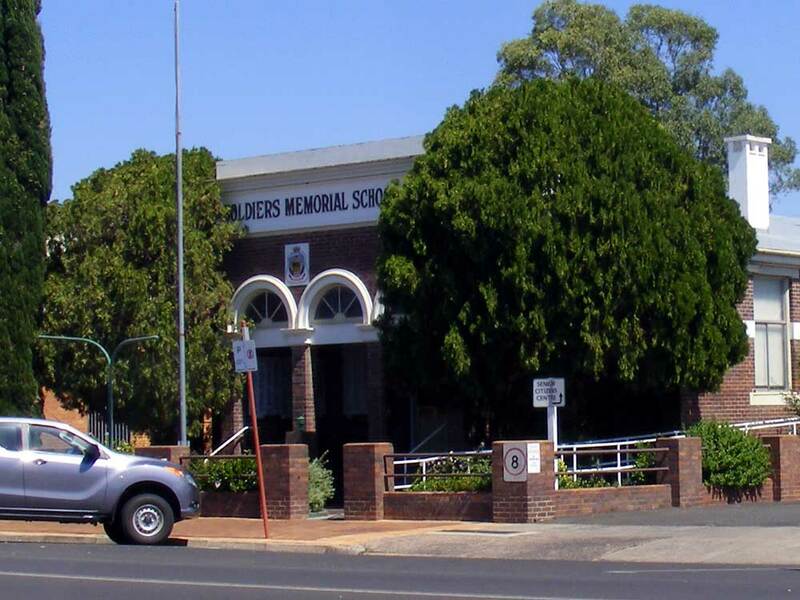 At an enthusiastic meeting held in the Shire Hall last night it was agreed almost unanimously that the fallen soldiers' memorial should take the form of a public hall. 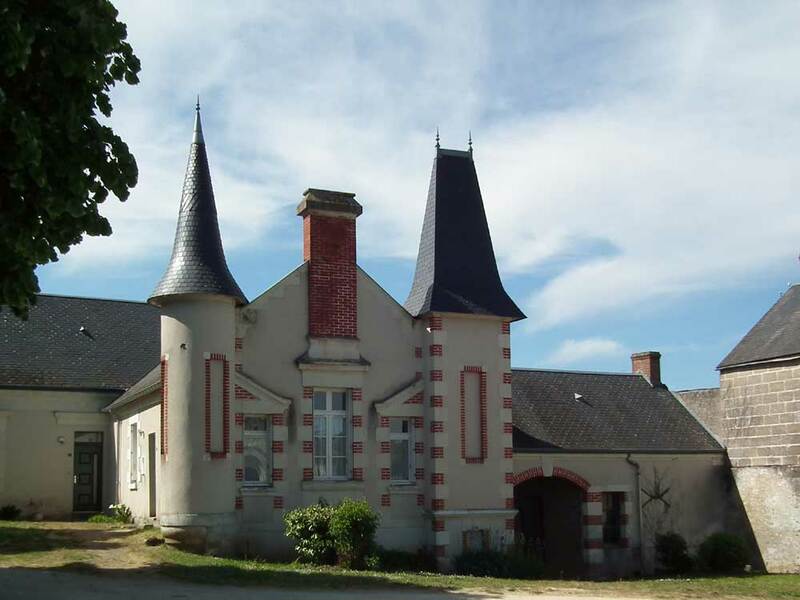 It was estimated that the hall would cost at least £2030. The Brisbane Courier, 12 March 1921. 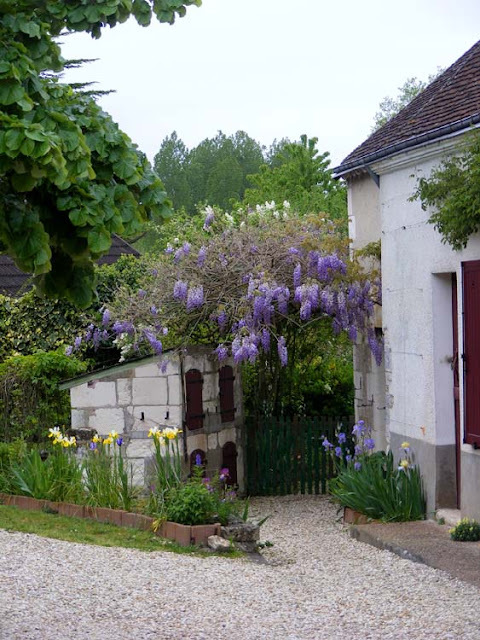 I like this photo, it's part of an old wine press made by "Pressoirs Colin" of Montreuil. 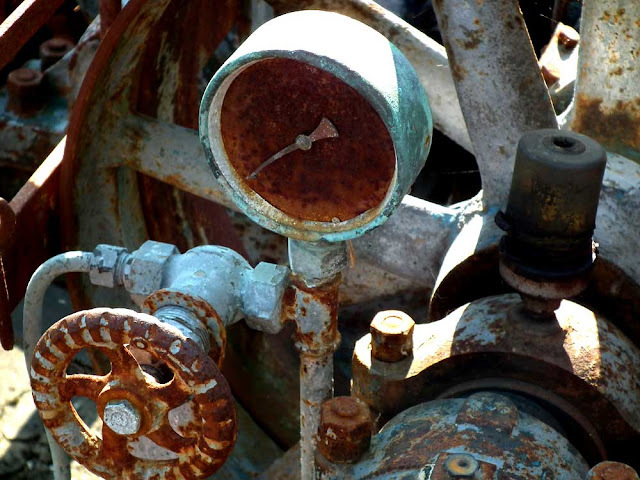 I took the photo at Chateau Gaudrelle where it sits, gently rusting, in the car park. 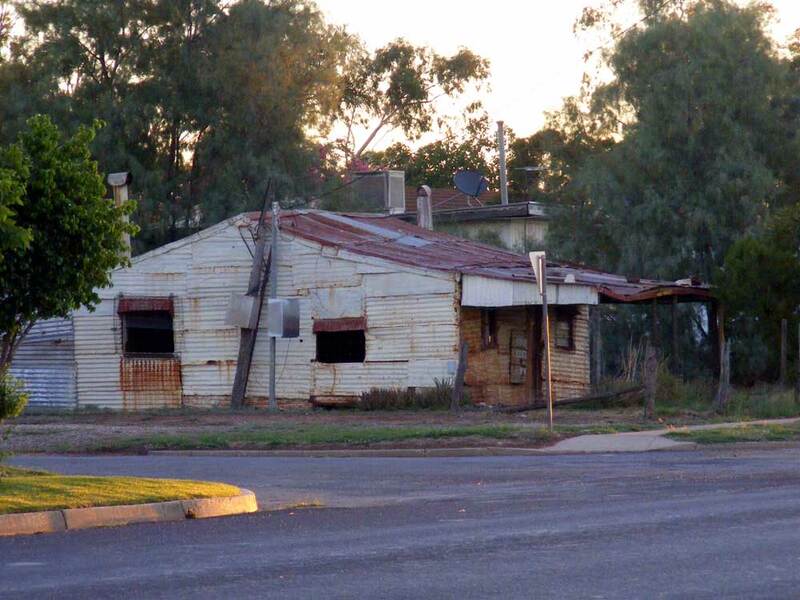 This is the Australian Hotel, St George, Queensland, Australia. It was taken at sunrise after a particularly spectacular evening of rock and roll. After playing from 8.00pm to 1.00am we sat on the balcony and had a couple of sociable drinks before heading to bed. After an hour or so I got frustrated chasing the bed around the room so went for a walk instead. We played St George a number of times over the years and always had far too much fun. Part of the aftermath of that evening may be read about here. Tomorrow is St George's day. 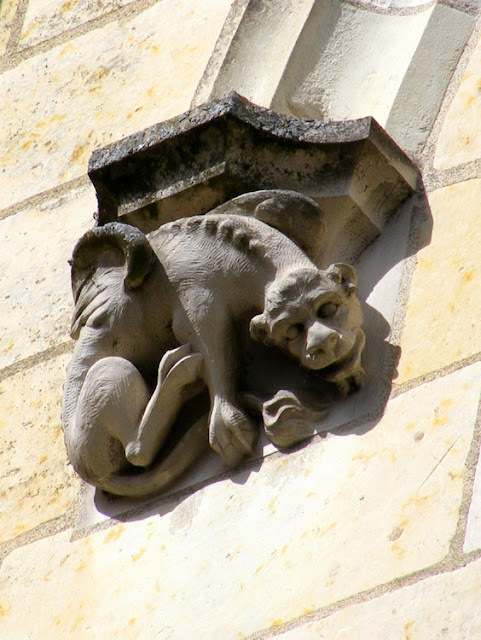 He is patron saint of: Preuilly sur Claise, Aragon, Catalonia, England, Ethiopia, Georgia, Greece, Lithuania, Palestine, Portugal, and Russia, as well as the cities of Amersfoort, Beirut, Fakiha, Bteghrine, Cáceres (Spain), Ferrara, Freiburg, Genoa, Ljubljana, Gozo, Milan, Pomorie, Preston, Qormi, Rio de Janeiro, Lod, Barcelona and Moscow. He is also the patron saint of the Boy Scouts, skin disease sufferers and syphilitic people. To celebrate that, today Preuilly has its Foire de la St Georges, a fête foraine (a travelling fair, held on fixed dates in different places). There will be a couple of fun fair rides, some brocante stalls, and the local organisations will have displays and stalls selling stuff. 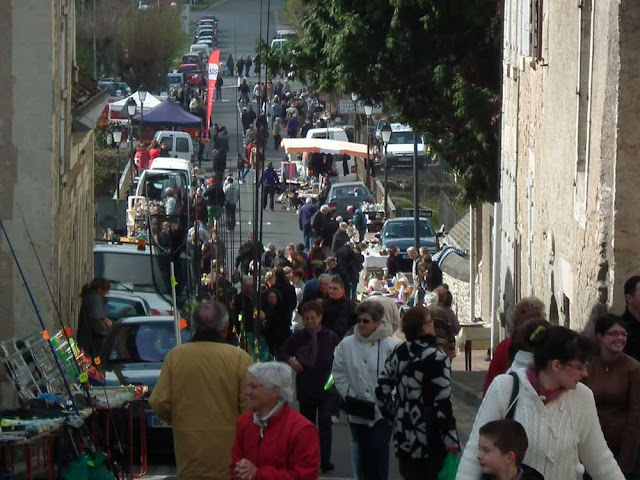 The Fete is always held on the 3rd Saturday of April which sometimes brings the date into conflict with fairs in nearby villages, so one can never tell just how populous the event will be. We will be there anyway, maybe for a lunch of sausage and beer. Which last year was very good. Over Easter the chateau at Boussay hosted a large family gathering. 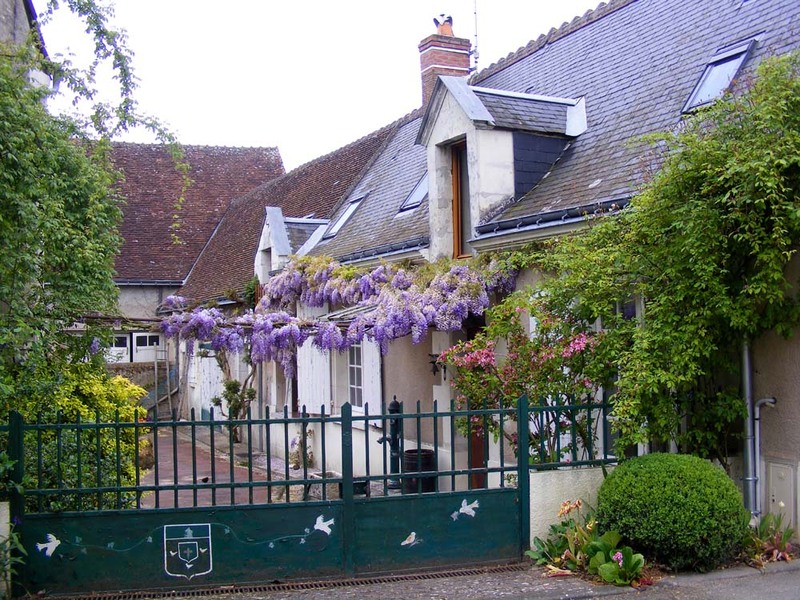 The owner, a general in the armed forces who is in charge of the school for officers going into the logistics, supplies and administrative fields, comes from a large and close knit family who have owned the chateau here for a thousand years. When we visited friends who live opposite on Easter Sunday there was a lively and raucous game of football going on. I was not the only person to photograph the goings on. I noticed two other passers by doing so. The family appeared to be unconcerned by being the object of all this attention. At least, the family members we spoke to did. Last week our friend Alexis visited. Alexis is a Prulliacien who lives in Brighton (England) with his family, but at school holiday times he and the family visit his mother who still lives just outside Preuilly. 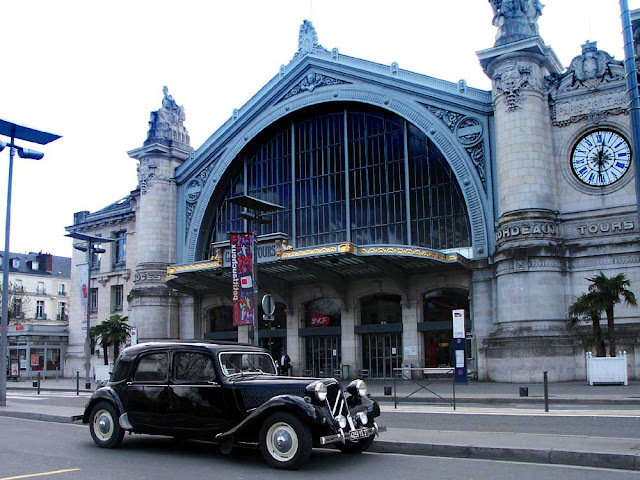 This time, Alexis bought his drone, and suggested we took one of the Grandes Dames for a drive while he filmed. Not being one to miss an opportunity for publicity, we quickly agreed. This is the result after I edited the footage. The original is in high definition, but I think this gives a really good idea of the area we live in. On a recent botanical outing we came across the fungus called in English 'King Alfred's Cakes'. 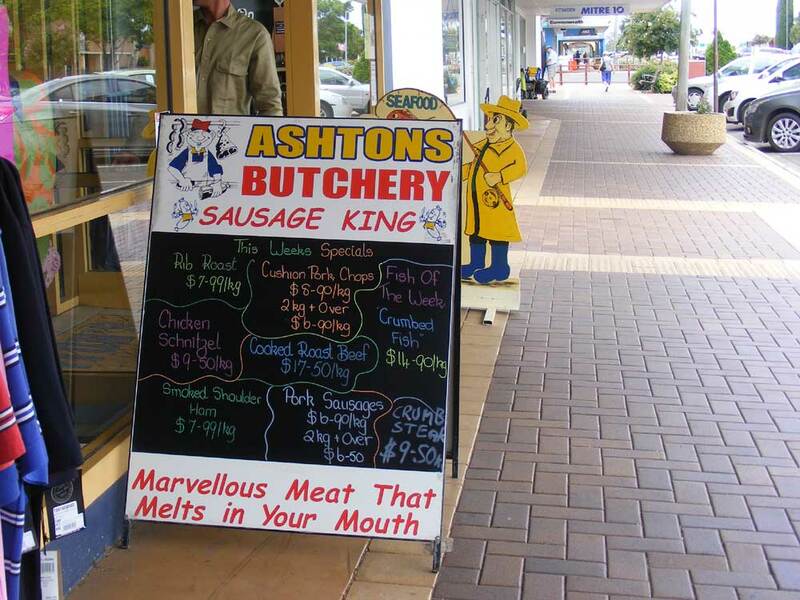 The name comes about because it resembles burnt cakes, such as might have been the result of King Alfred's lack of attention when asked to mind the cakes on the griddle in the well-known English legend. 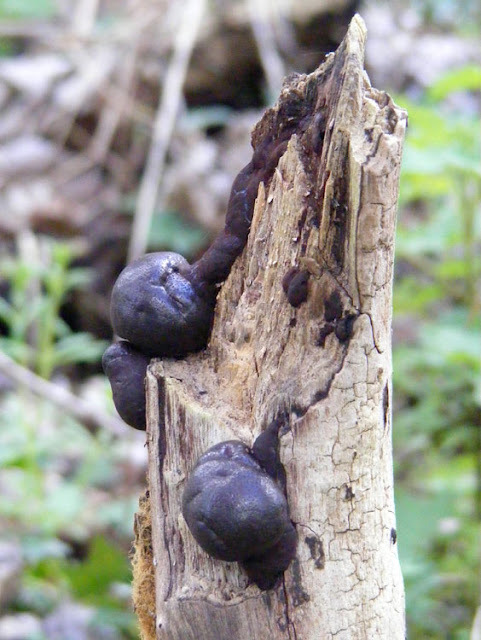 Since this legend has no resonance in French history, the fungus has a much less imaginative French vernacular name -- Daldinie concentrique, merely a Frenchifying of its scientific name Daldinia concentrica. 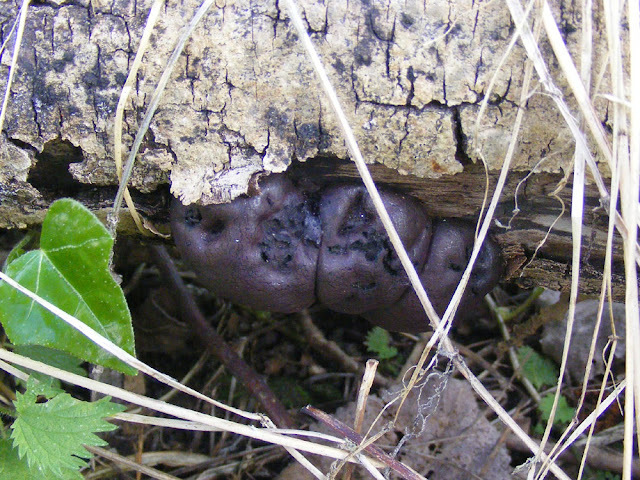 The species is also very commonly known as Cramp Balls, as well as having several names which refer to its resemblance to coal, such as Coal Fungus and Carbon Balls. 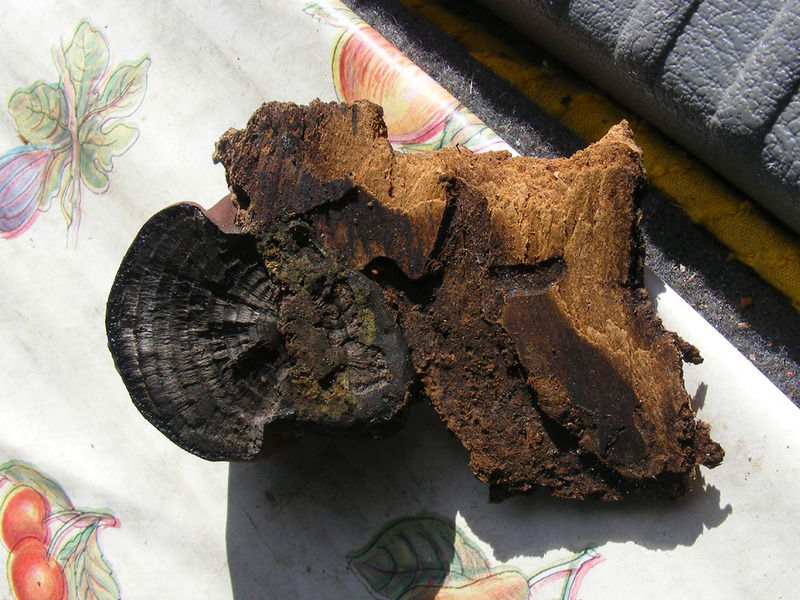 It occurs over a wide range and is especially associated with fallen Ash Fraxinus sp (Fr. Frêne) trees or branches. Dissected to show the concentric rings. It gets its scientific specific name because of the concentric growth layers, each representing a reproductive season and easily visible if you cut a specimen in half. It seems to be a fungus which copes well with dry situations and less well with too much moisture. 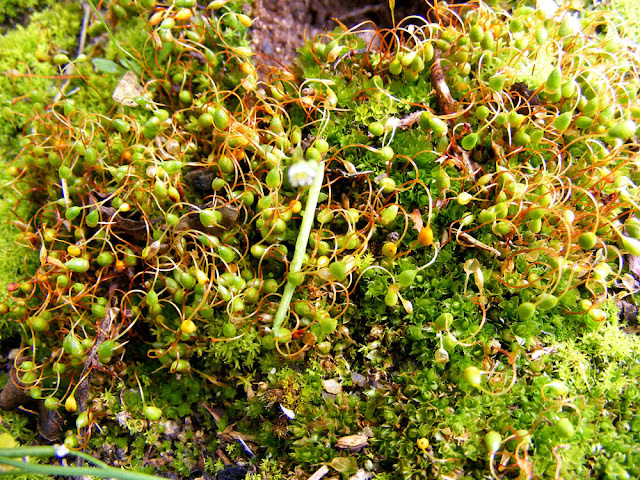 It competes vigorously with mosses and algaes in its vicinity to take a large share of the nutrients available from the process of decomposing wood and produces chemicals to eliminate its rivals. It is also one of the fungi that can be used as tinder, smouldering with a distinctive odour and requiring careful attention to keep ignited. There are 19 species of Araucaria around the world, native to New Caledonia, Norfolk Island, eastern Australia, New Guinea, Argentina, Chile and southern Brazil. They grow into great big trees, mostly with viciously spiky leaves and some with edible nuts. They are often referred to as living fossils, relicts of the early Mesozoic (also known as the Age of Conifers) when their distribution was global, 250 million years ago. It is thought that the long necked sauropod dinosaurs browsed on them. 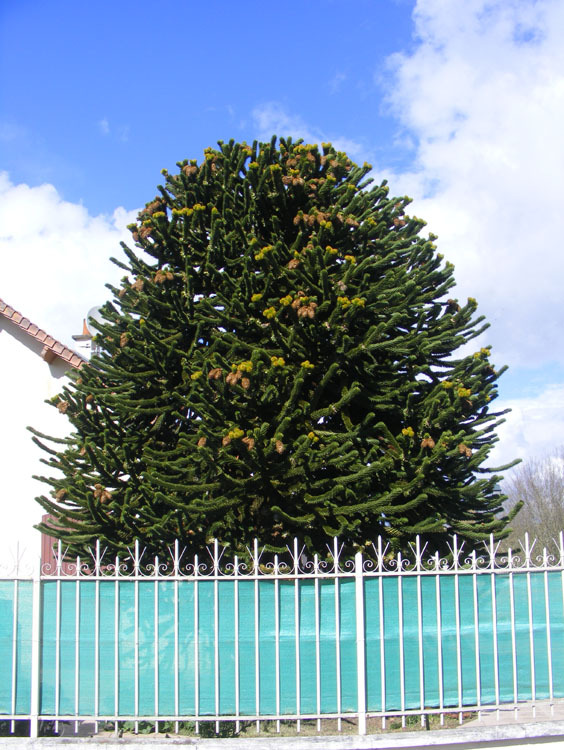 A young Monkey Puzzle in a garden in Saint-Epain. The species I know well are Monkey Puzzle A. araucana, Bunya Pine A. bidwillii, Hoop Pine A. cunninghamii and Norfolk Island Pine A. heterophylla. Monkey Puzzle is the one you see in western European parks and gardens. Sadly it is all too often planted somewhere way too constricted and the homeowner lops the crown out of the tree, creating a travesty. The one shown in the photos is a relatively young tree, with its branches still gracefully sweeping down to the ground and growing thickly for the full height of the trunk. It's got room to grow some more and I hope the owners enjoy it for decades. This species is sometimes called le désespoir des singes in French ('monkeys despair'). The vernacular names presumably reflect the difficulty of getting at the nutritious and tasty nuts, protected as they are by the prickly foliage. 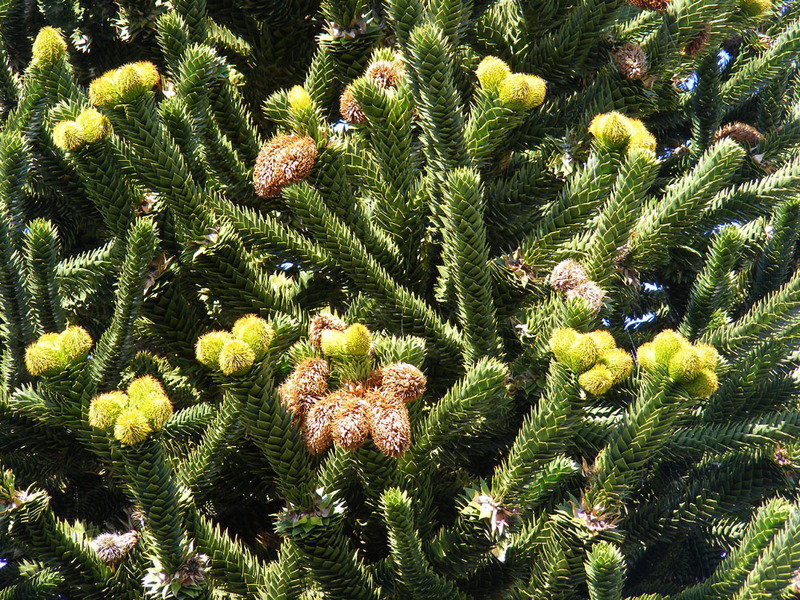 Monkey Puzzle foliage, and rather unusally, male (brown) and female (lime green) cones on the same tree. Ian Fraser has written recently on the Bunya National Park, an area of lowland temperate rainforest which is close to where I lived in Australia, and where the best concentration of Bunya Pines grows. I had a Hoop Pine in my garden in Australia. It had been planted as a seed by the daughters of the previous owner, 50 years earlier. 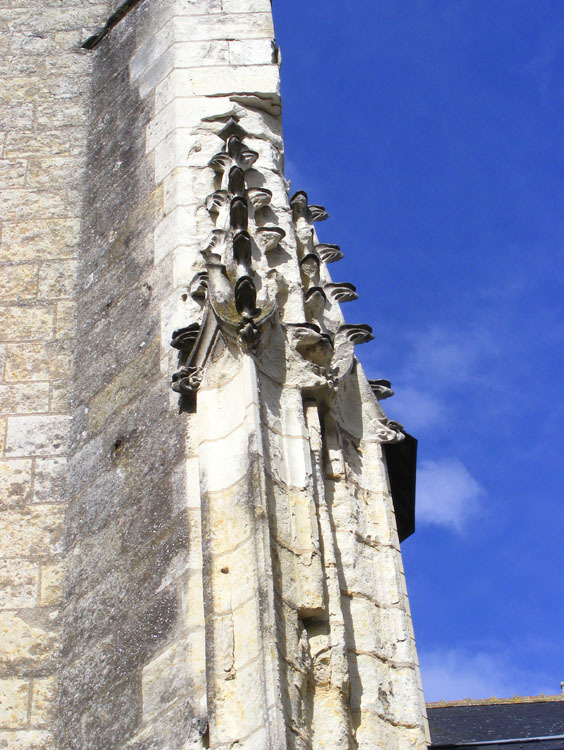 At some point it had been hit by lightning and was a bit scruffy looking at the top. Every now and then I would notice a koala in it. They don't eat Hoop Pine so it must have just been in transit. Norfolk Island Pines are common at the coast in eastern Australia, planted to provide shade and landscaping, often very close to the beach because as small island natives they tolerate the salty seaspray. I've written about them before on the blog. 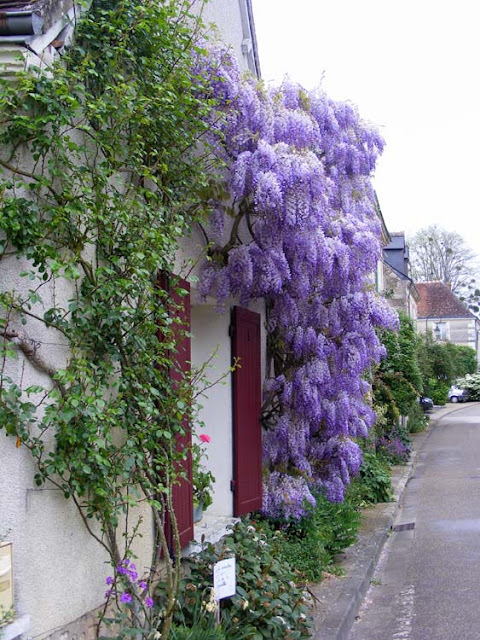 All these fabulous wisterias were photographed in May last year in a single small village. 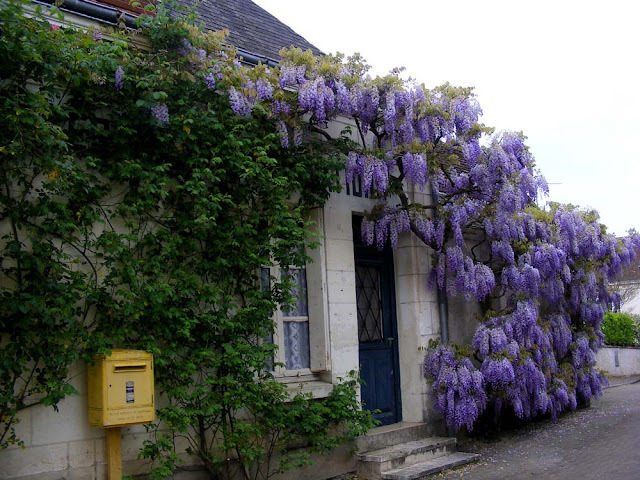 Chédigny is most famous for its roses, but the wisterias and lilacs peak before the roses have really got underway. 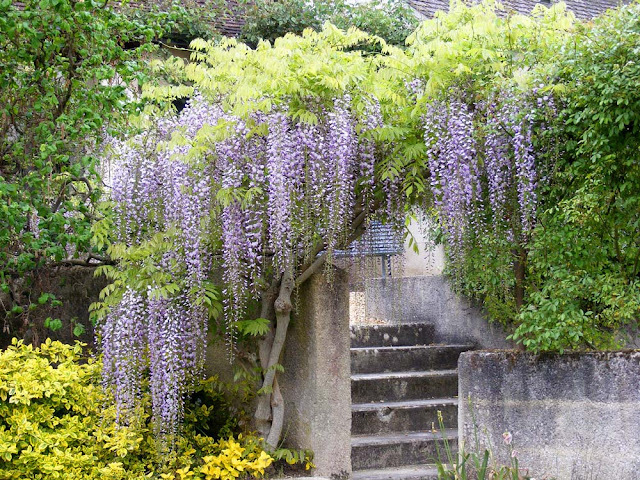 The last one is a Japanese wisteria, with its very long racemes of flowers, as opposed to all the others which are the Chinese species. 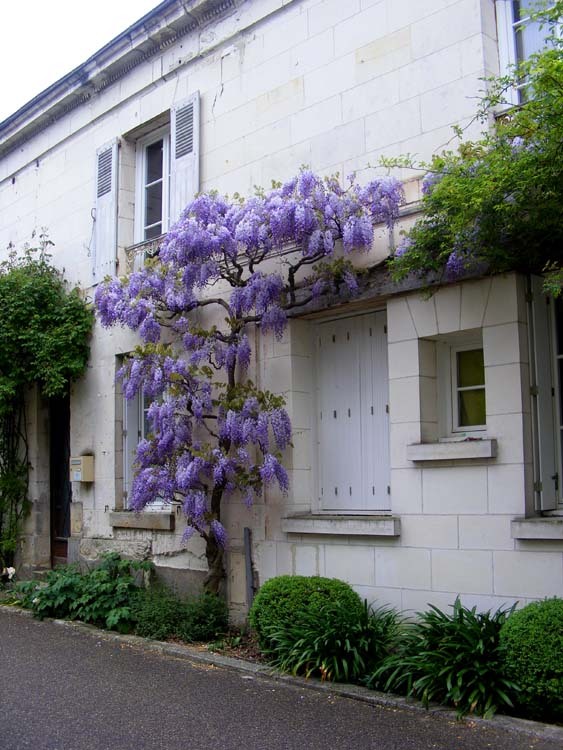 And in the first photo there is a white wisteria not quite in bloom on the left. This year the wisterias are out a couple of weeks earlier than last, but it's another magnificent display. 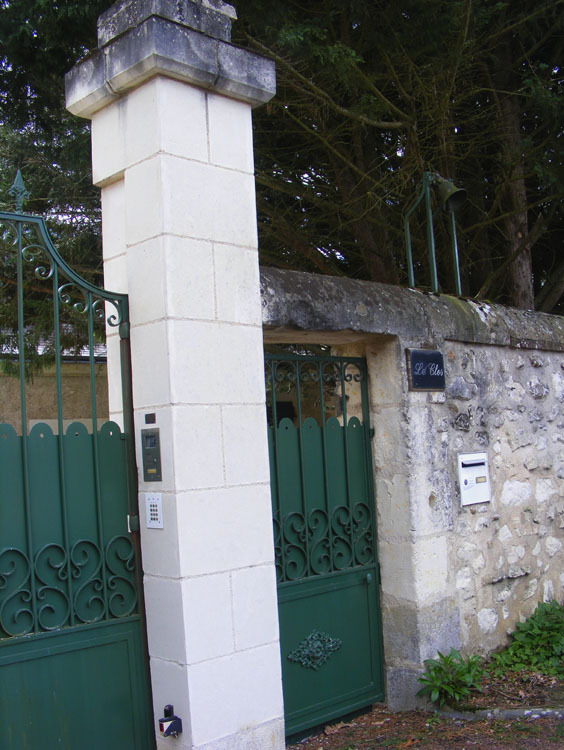 This gateway includes a couple of centuries of doorbells. There is a quite substantial 19th century bell on a frame that you would have pulled a chain to ring (now tucked carefully out of reach) - top right. There is a neat circular hole in the wall to the left of the letterbox that would once have held an early 20th century electric bell press. And on the gate pillar there is a modern electronic entry intercomm and number pad for tapping out a secure entry code. Silvery Thread Moss Bryum argenteum (Fr. Bryum d'argent), always found growing on stone. Recently I went on a rather dull botany outing. Luckily, the church in the village was covered in all manner of lichens, mosses and algae, and some of us got well and truly side tracked. We found Silvery Thread Moss on the pavement in front of the church. The cracks between the paving stones where we found it is very typical habitat for this species. This is a very easy moss to identify, because of its silvery hairs which give it a shining appearance whether moist or dry. It is widespread and abundant. A lichen, Caloplaca cf flavescens. 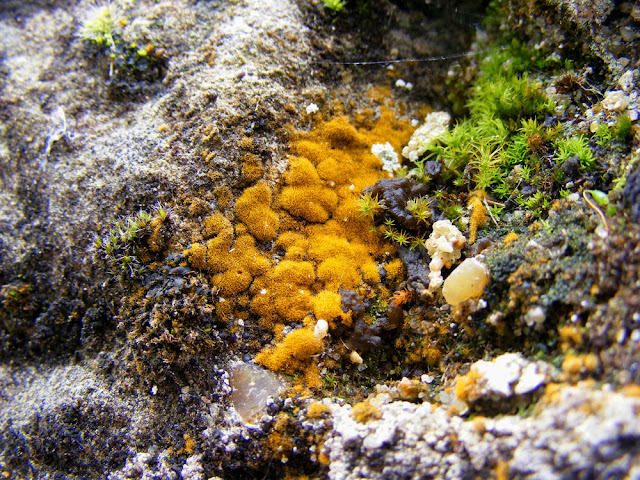 The orange lichen Caloplaca sp (probably flavescens, but there are several lookalikes) often has white zones. 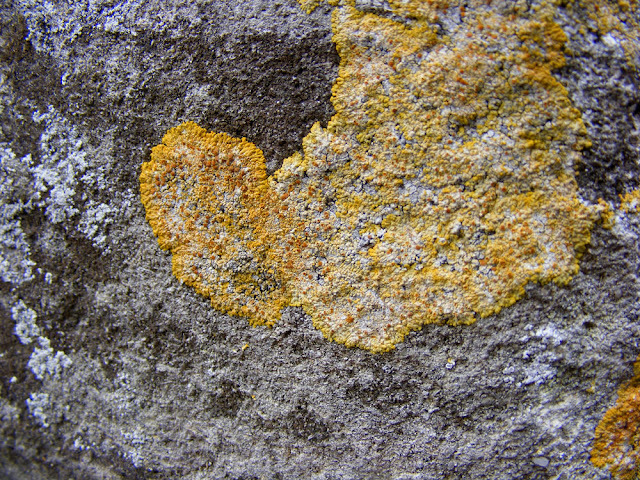 It is common on limestone walls like this. 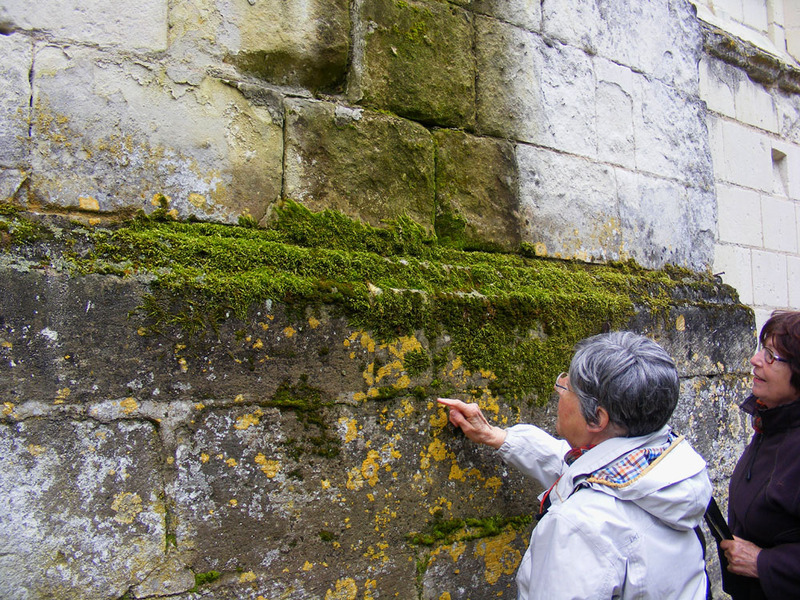 Looking at the mosses on the church -- there are maybe a dozen species here, all growing together and intermingled. 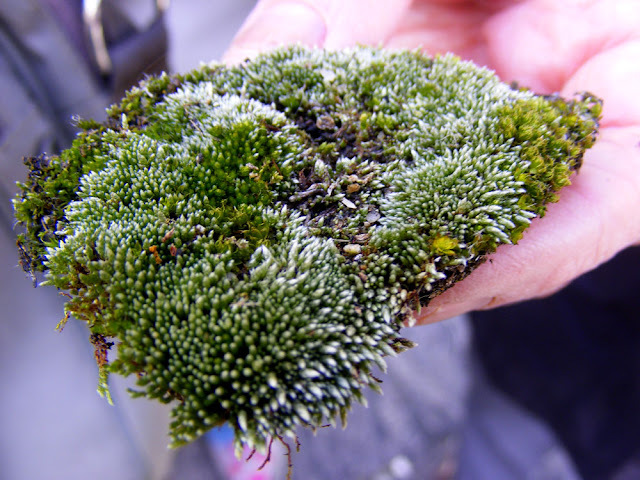 A Cord Moss Funaria sp. Cord Moss is so called because the seta (the stems which hold up the capsules) are coiled like a rope when dry, but untwist when damp. An alga Trentepohlia cf aurea. You would never guess it to look at it, but Trentepohlia aurea is a 'green' alga. It contains a beta-carotene type pigment which gives it a characteristic orange colour, which hides and protects the green chlorophyll. It is common on rocks and walls, especially damp limestone. 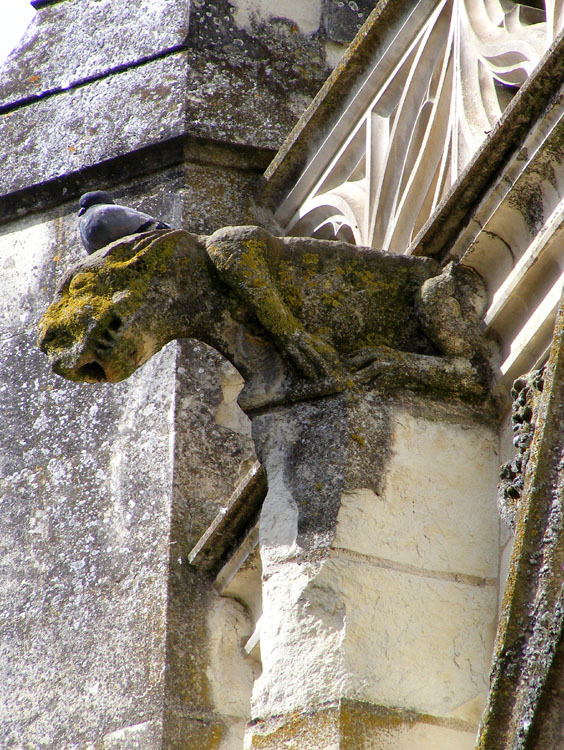 It grows either independently, or in a symbiotic relationship with lichen, providing photosynthesis services. If you are looking for something to keep you entertained in the kitchen over Easter, try making a Neapolitan Easter Crown. It's essentially a stuffed pizza crust forming the crown, studded with whole eggs still in their shells and held on by grissini instead of jewels or thorns. It's much easier to do than it sounds or looks. Make some pizza dough with wholemeal flour and added grated Parmesan cheese and leave to prove for a couple of hours. Meanwhile combine ingredients for the stuffing. You could use any combination of toasted pine nuts, spicy salami, chopped herbs such as basil or parsley, dried tomatoes and grated strong cheeses. Put aside about 100g of dough. Roll out the rest into a large rectangle and sprinkle the stuffing even over the dough. Roll the dough and stuffing from the long edge and form a log. Brush the dough with olive oil as it rolls over. Lift the log onto a baking tray and bring the ends together to form a ring. Leave the ring to prove for an hour. 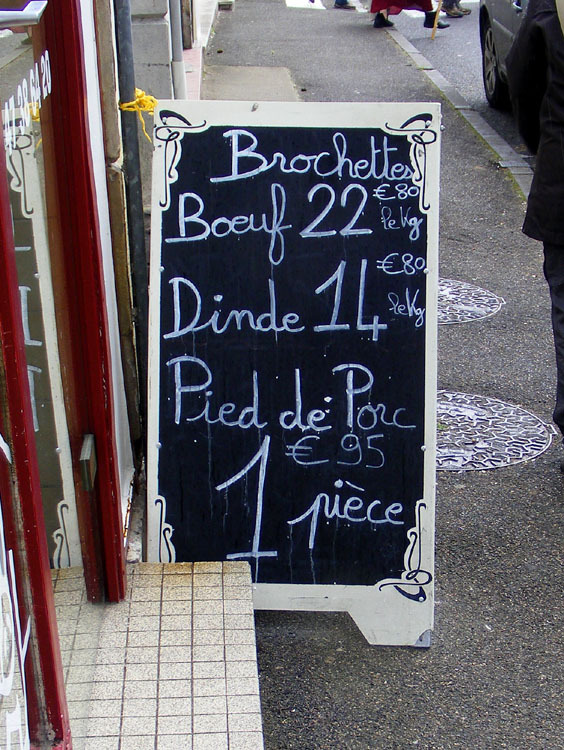 Take the set aside dough and divide into 12. Roll each piece into grissini. 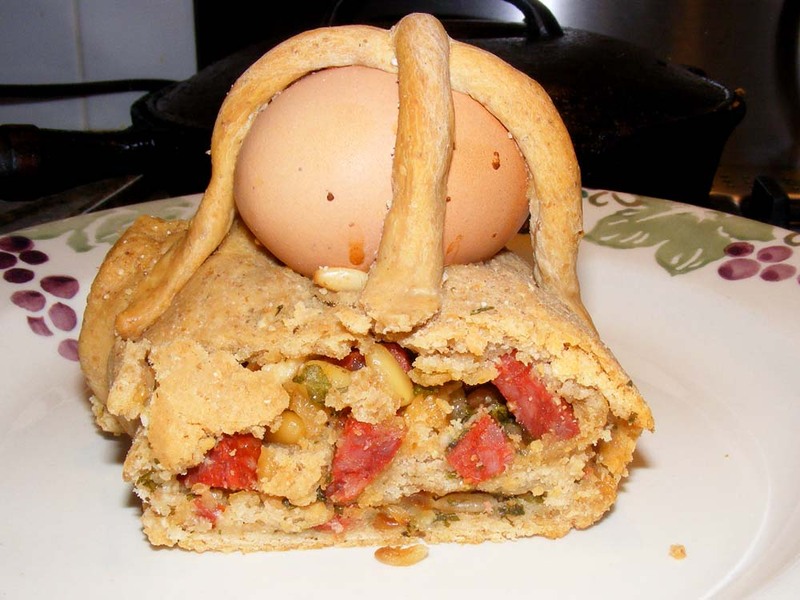 Carefully place 6 raw eggs in their shells on top of the stuffed dough ring and secure each of them with two grissini forming a cross over the egg. Bake the crown for 15 minutes at 160°C then for 40 minutes at 180°C. 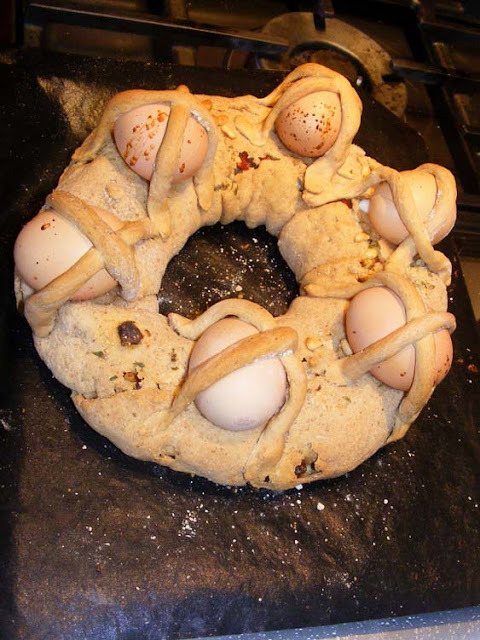 I know this isn't a French recipe, but it's a version of a recipe I saw on French Armenian chef Sonia Ezgulian's blog and I made it last Easter for fun. I recently photographed this butcher's blackboard on the street of a nearby small town. He has beef kebabs for €22.80/kg, turkey for €14.80 and pigs trotters for €1.95 each. Not actually the church but a nearby building with an interesting square tower. 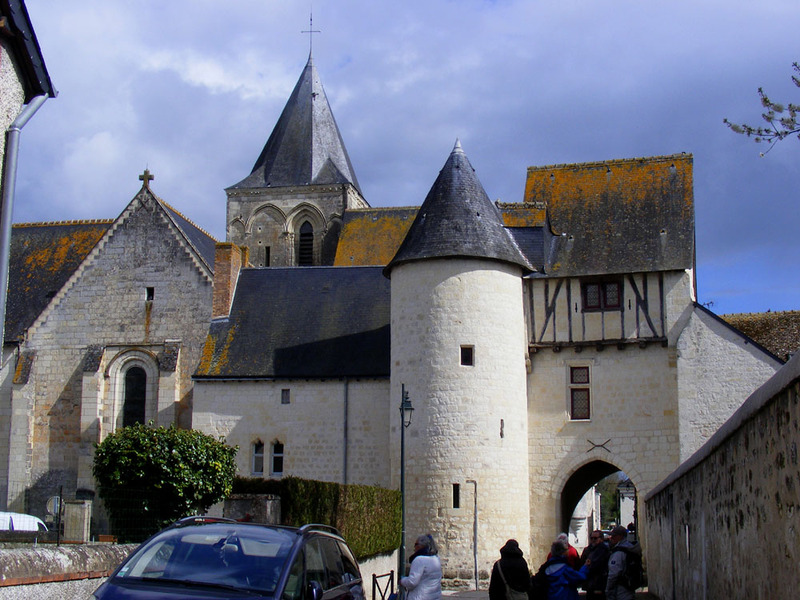 Erected in the 12th century, on the site of an older building, it grew from the Romanesque apse in the Poitevin style. 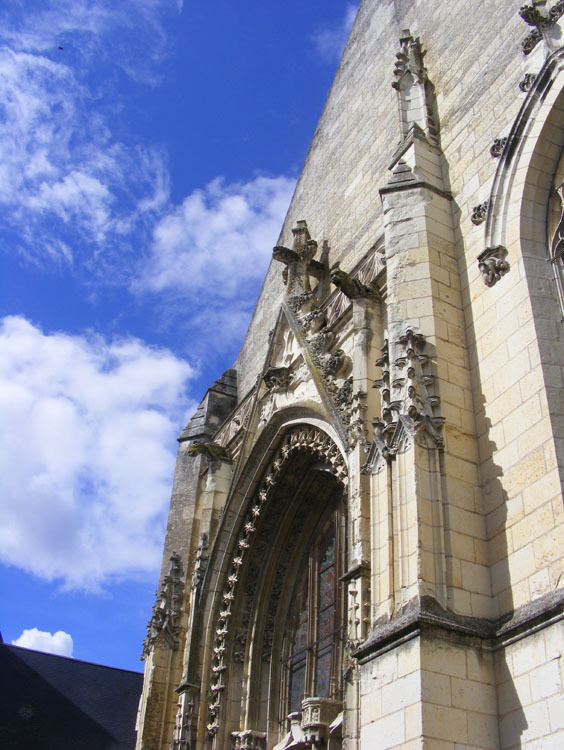 At the transept crossing, tall gothic windows pierce the square 12th century tower and make it appear higher. The tower roof is a sort of multi-sided cupola. The back of the church and associated buildings. 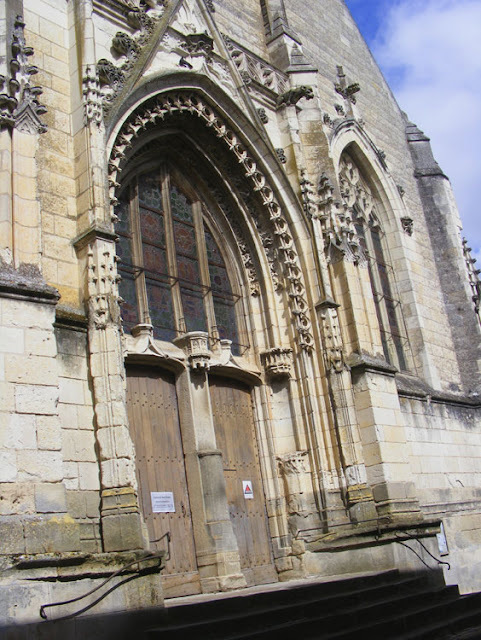 This building, partially in the Angevin gothic style, was enlarged and remodelled in the 13th, 15th and 16th centuries, and restored in the 19th century. It was classed as a Historic Monument in 1913. Apparently the choir still has its magnificent oak stalls from the beginning of the 16th century, but I've never been inside to see them. There are several dozen plants on the hillside behind their house. Our friends Rosemary and Jean Michel have a lovely little colony of Early Purple Orchids (Fr. Orchis mâle) in their garden in Blois. 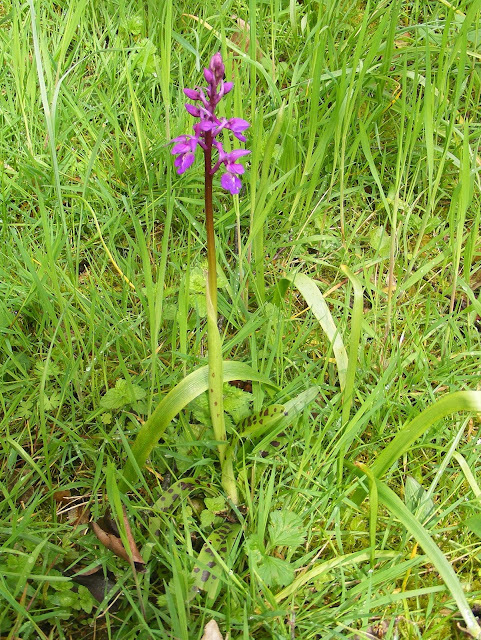 They have at least three other species in the garden, but the Early Purps are the first to flower. 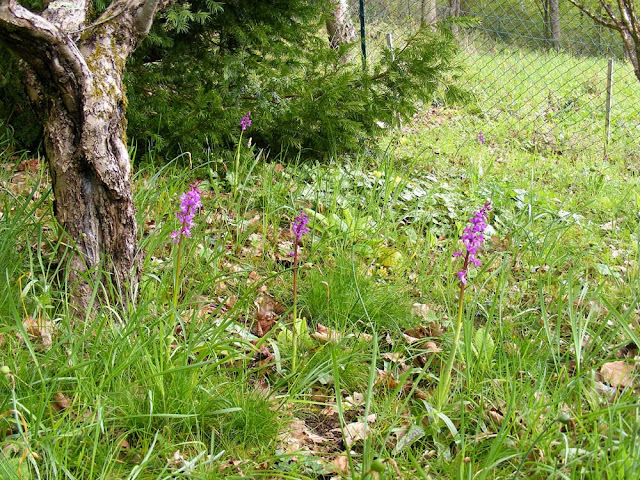 These were photographed twelve months ago, but these pretty orchids are out in flower again at their place now. (although not all of the plants in a colony will show spots). On Thursday Susan wrote about walking the mean streets of Saint-Epain looking for weeds. It might have been a easier task in Lightning Ridge in central New South Wales, although the famous opal mining town isn't as ruinous as this photo might lead you to think. 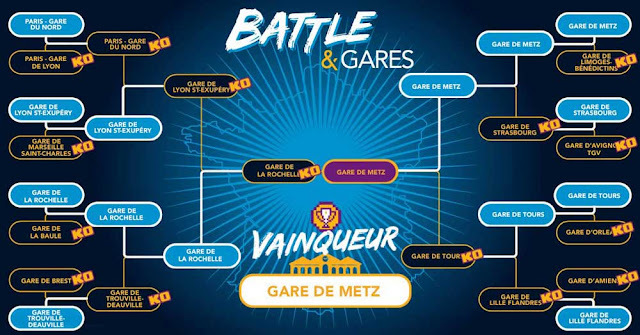 An odd name for a post, but I couldn't work out why Tours had recently been announced as "amongst the four most beautiful station in France" with Metz at number one, and no indication of where Tours had come in this very important competition. 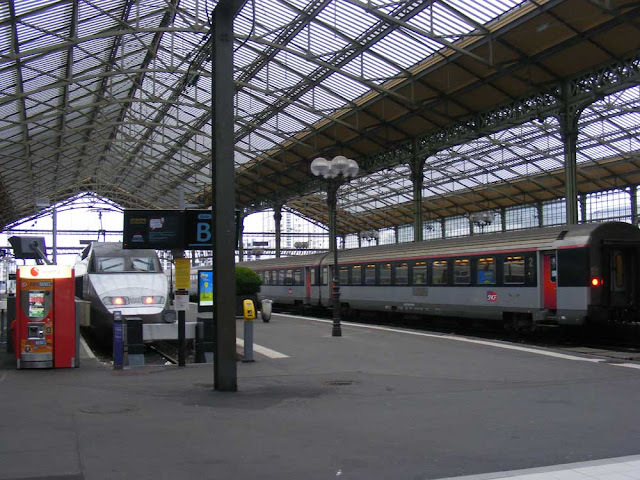 I assumed it was at number 4, otherwise it would have been named as being "amongst the three most beautiful station in France". But no - it's not a league table, it's a knockout competition, and Tours was eliminated in the semi final. 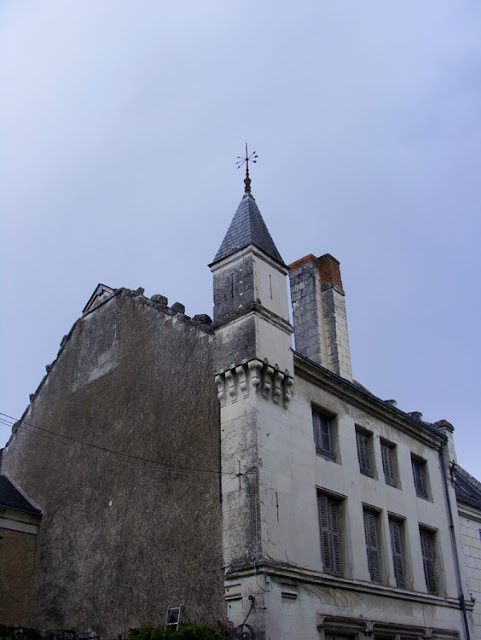 looked like this seven years ago and is currently be-scaffolded. in the way to spoil the view. We took this photo last month. The places where the ceramic panels were are currently covered, so we assume they are off being conserved.